Plastering Services Huddersfield | Harry Brook & Son Ltd.
We offer a full range of plastering services. Traditional two coat plaster applied to block, brick and masonry backgrounds in order to provide a durable finish and reduce sound transmission. 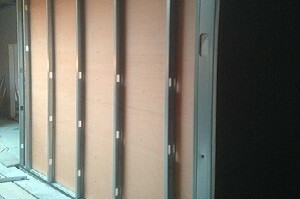 Plasterboarding to timber stud partitions using a collated screwgun. All our plasterboards are fixed using this method of work. Drylining/Dot & Dab to all block, brick and masonry backgrounds. A thermal plasterboard can also be used to achieve a greater U-value. 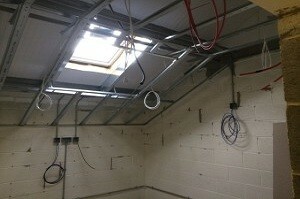 Application of plaster skim to ceilings and walls using all the up to date methods. Through coloured renders applied in various colours. It can be one coat direct to new blockwork or two coats to existing surfaces with an acrylic mesh bedded in to provide additional strength and avoid cracking. An attractive and maintenance free finish. We are approved Weber Render applicators. Traditional two coat sand/cement render with a decorative pebble spar finish available in an assortment of colours. Installation of MF suspended ceilings with a plasterboard and skim finish often used to hide containment or to provide a plastered finish under a concrete floor.